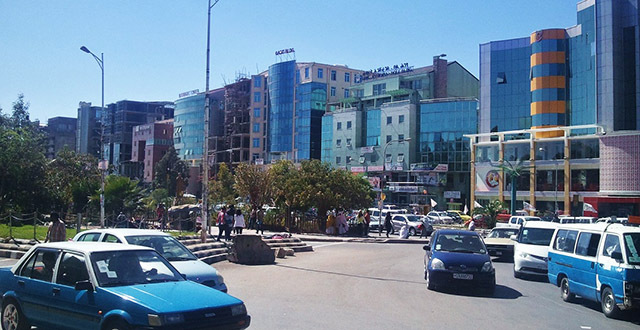 Simply, Bole is where one usually goes to find most of the luxuries that Addis hast to offer and it’s considered to be the nicest part of Addis by most of the city’s residents. It’s the part of town that has transformed very rapidly within the past decade in to a concrete jungle. A construction site can be seldom avoided nowadays while walking on the two parallel Bole roads. Bole stretches from Meskel square all the way to the airport. And also the road parallel to the Bole road which stretches from the Atlas area to the airport is also considered as Tele Bole/Bole Medhanealem. Living in Bole is without a doubt very costly. If you want to live in a two bedroom furnished house close to Bole road you’d better be prepared to pay anywhere from $1,500 to $2,000 USD a month. It is the same with apartments, if not more. If it is tucked away at the back or your landlord lives with you in the same compound, you can sometimes find houses for around $500 less. And, of course, there are those houses that you’ll end up paying a gazillion dollars for while most prefer to live in a shared house with friends to be able to afford the conveniences. These large, fancy houses are around but are usually the domain of the highly-paid types. For short stays there are always guest houses like Mr. Martin’s Cozy place offering rooms for as low as $25 a night. There are plenty of stores for clothes, shoes, and accessories along Bole Road – they’re actually pretty hard to miss. You’ll find all kins of stores in mixed use buildings like the Getu Commercial Center, DH Gheda Tower, and the Friendship Building. You can also find loads of all kinds of shops in two of the city’s few malls: Edna Mall and Dembel City Mall. As for supermarkets, there are quite a few. There are two medium sized grocery stores just by Edna Mall and also larger ones like Shoa Supermarket by Wollo Sefer, Novis Supermarket by Japan Road, and Friendship Supermarket inside the Friendship Mall. If you are up for a work out you are in luck. There are gyms inside most of the hotels in Bole that are open for memberships. If you want a swim with your workout you can sign up at Harmony Hotel or Bole Rock. If you’re in to saunas, Desalegn Hotel has a gym membership package that includes their sauna. If you want to watch movies fresh out of the box office then the Matti Multiplex is the place, located inside Edna Mall. And in the same mall you can find a 7D cinema if you want to get your blood pumping with six minutes of sheer excitement (but it is not for the pregnant or the faint of heart). Ah Addis… where seven dimensions come straight to your cinema seat. Also in Edna mall there is a gaming zone full of fancy video games and gizmos for those who are cooler than the rest. Even though the place in swamped with kids most of the time it is fun to bear with it for a couple of hours to enjoy racing and shooting stuff. At least once. There are three tennis courts that are open to the public around the Bole Dildiy area if that is the kind of thing that you’re into. But it is advised to go early to avoid long waits. Oh where do I start, if there is one thing that Bole does not need more of, it is cafes. There are cafes almost every 50 steps you take on Bole road. Kaldi’s Coffee – This is the biggest café chain in Addis and Bole was where they first started. There are at least four more in the Bole area alone. They are mostly known for their frappuccinos and coffee. Natani Café – This cafe known for its cheese cake and people just can’t stop talking about it. Maybe it is time to go try it. They cannot all be wrong. Paresienne Cafe – This is one of the popular cafes in town to meet friends in the morning, have some bacon with your breakfast and gossip before going in to work. There are a few very nice restaurants in Bole for those who roam its streets. Bole is where people usually go to wine and dine. These restaurants are expensive compared to ones in other parts of town but many agree that they’re worth the extra buck. Le Grand Rev – This Italian restaurant is tucked away behind the main road and is a place that people choose this place for its serenity. And of course the food. Rodeo – This is a bar/restaurant that has a western cowboy look and feel to it. Overwhelmingly decorated with signs and souvenirs, Rodeo offers a cocktail and food menu like no other. The bartender is none other than the owner himself and the service is great. They play nice music on a big screen too. Antica – This is one of the nicest restaurants to go to as they have very good food, an excellent service and they even do deliveries. Yod Abyssinia – This is a cultural restaurant by Bole Dildiy where foreigners flock to on their first visit to Addis. Yod serves tasty Ethiopian food and drinks to its customers while entertaining them with some live performance by traditional bands and dancers. It is quite a fun place to take someone on their first day. Bole is the place to party. It is responsible for the purchase of too much Panadol and the producing of too many scandalous nights. There are enough bars and lounges in Bole to make half of the area’s workforce call in sick the next day. Black Rose – This is a lounge with easy listening and world music playing at all times. But don’t let that fool you, it is at black rose where ‘out for just a couple of drinks’ can lead easily to club-hopping the whole night. They serve various cocktails and shooters along with a few snacks to make the morning bearable. The service is very good but you will surely pay good money for it. Quite a bit. Flirt Lounge – One of the places that partiers go to before heading to the 4AM clubs. It has a live band playing two nights a week and a DJ during the weekends. They have a VIP area upstairs where the prices are a bit more than downstairs and they also serve shisha (hookah) up there for the privileged. Tri-up – This is a restaurant/bar by day and changes to a mad party house by night. The music gets louder and the fun gets merrier as the pendulum keeps swinging. The crowd is mostly young and fun loving so there’s no doubt that you will see people busting moves even though it’s not a club. Oh Canada – A quiet place where you have meals with friends and family during the day but the story changes on the weekend. The Ottawa Senators obsessed owner/manager Lily turns her backyard in to an awesome party den. Great music and nice atmosphere.